Six Sigma is a methodology employed by many large companies to improve the output quality of their business systems and processes. Small-business owners can profit immensely by becoming familiar with the fundamental principles. Three major concepts will aid in your understanding. A "quality" product or service is one that conforms to standards. Quality refers to an acceptable level of performance within an approved range of customer specifications or expectations. For example, are the roof shingles the grade specified in the house plans? Has the steel part been machined to engineering specifications? Was the furniture delivered within the promised time range of 8:00 a.m. to 10:00 a.m.? Are the restrooms "clean"? Simply put, are your products or services up to specified or expected standards? Quality standards are determined by the customer, whether expressed or implied, as in the case of clean restrooms. The “voice of the customer” indicates what matters most to your customers—what is “critical to quality” (CTQ). These essential requirements might include such things as first-class workmanship, on-time delivery, or superior customer service. 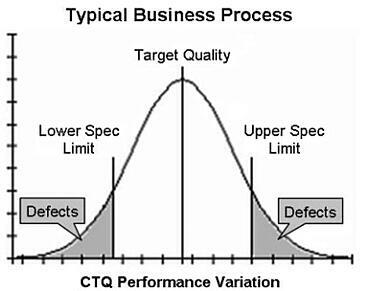 While no organization is perfect, repeated failure to meet customer CTQ requirements is usually fatal. If you don't provide what customers expect, they will take their business elsewhere. “Variation” is the deviation from customer specifications or expectations. All quality standards have a tolerance for some variation. 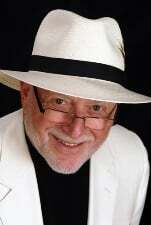 However, when variation becomes too great, the product or service is defective and unacceptable. Defects, delay and deviation must be kept within the bounds set by the customer. The output quality of any process is considered “perfect” if it falls within the lower and upper specified limits, as you see in the graph below. For example, if the furniture store mentioned above delivers the furniture before 8:00 a.m. or after 10:00 a.m., it has performed outside the promised limits. Delivery anytime between those hours is a perfect outcome. In football, a field-goal kick passing anywhere between the goal posts is a perfect kick and earns three points; if kicked outside the posts, no points are given. Likewise, a machined part may have a tolerance of .003 inches. If machined outside of the tolerance limits, the part will not fit or work properly. 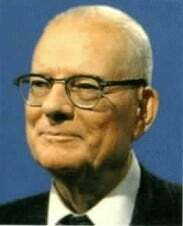 Sigma, expressed by the letter "Z", is a Greek term that means “amount of variation in a process, set of data, or anything you can measure.” For statistic students, Six Sigma refers to six standard deviations; however, it is not necessary for you to understand the math to apply the principles. Using Six Sigma analysis, a process is evaluated based upon how many errors occur in one million opportunities for error. No matter how few or how many outputs there are from a given process over a period of time, the result is always converted to “defects per million.” In this way, all quality measurements are compared to a common standard. For example, in a sample test period, 50 of 1000 prepared payroll checks have errors and employee complaints. Converted to Six Sigma language, there are 50,000 defects per million opportunities. This is done by multiplying the numerator (50) and the denominator (1000) each by 1000. 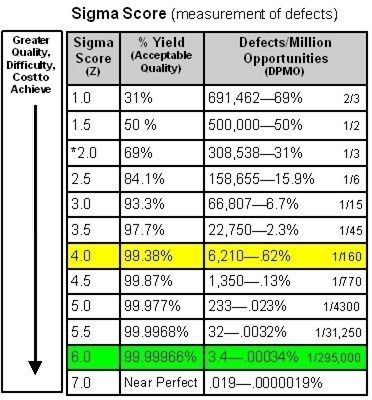 The fewer the errors, the higher the “Sigma Score,” and the closer the process comes to reaching perfection. Notice in the table below that 6 Sigma (statistically six standard deviations) is 3.4 defects per million opportunities—very near perfect. Two Sigma is 308, 538 defects per million or nearly one out of three errors. Three Sigma improves to 66,807 errors per million, or one error for every 15 opportunities—a 93.3% yield. It is important to note that the road to higher business quality gets increasingly difficult and expensive. 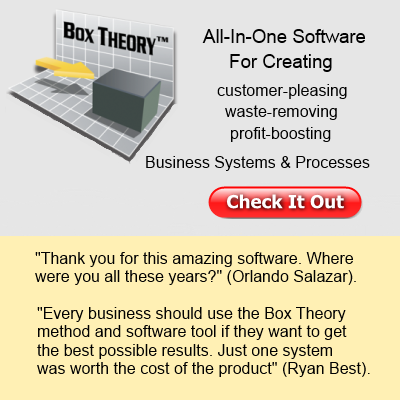 In Box Theory™ methodology, the goal is 4 Sigma for most processes. Four Sigma is actually one defect in 160 opportunities or a 99.38% yield. This is a very good starting point for the core systems and processes of most organizations. New companies typically start with processes at about 2 to 2.5 Sigma and progress with “common sense” and “trial-by-error” solutions to achieve control at near 3 Sigma. This may be somewhat shocking to you, but it points out the great opportunity for quality improvement in most organizations. Formal improvement methods such as Six Sigma are usually required to achieve greater results than 3.5 Sigma, a 2.3% error rate. Most errors happen because of faulty systems and not faulty people. People want to perform well, and will, if put into an effective business system. Mistakes and defects are normal. How many you will tolerate is a business decision. Remember, without a conscious effort to improve, you will hover in the 2-3 Sigma range and lose a significant portion of your potential profit. 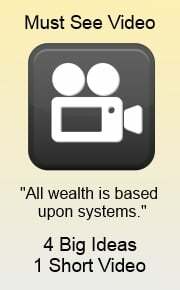 This is one reason why effective business systems pay for themselves many times over! I repeat, YOU are in control and can choose what Sigma level you are willing to pay the price to achieve. For example, the airline industry has chosen to pay whatever it costs to operate airplanes at above Six Sigma—fewer than 3.4 crashes per million flights (the voice of the customer is pretty loud on this one). However, baggage claims operate at 4 Sigma—a lost bag for every 160 handled. This is why airlines put a lost-luggage claim office in every airport. It costs less than improving the baggage handling process, and the customer has proven to tolerate an “occasional” lost bag. The airlines make these business decisions by balancing cost and customer satisfaction. Look at the table below to compare a 99% yield (less than Four Sigma) to a Six Sigma yield of nearly 100% quality. Then consider for a moment the potential lost profit in your company that is probably operating at 2-3 Sigma. Like the Theory of Constraints and Lean Thinking, the principles of Six Sigma apply in product or service-based companies, in the office, the retail store, or on the production line—wherever mistakes can be made. How many defects, unacceptable delays, or deviation from specifications/expectations occur in your business processes? I think you would be surprised! With a little attention to the details of your business operations, you can reduce the errors and waste to less than 1%. A small effort to improve business quality can significantly boost customer satisfaction, profit, and hopefully your take-home pay.